I went to a reading of Etel Adnan’s in the Serpentine last year and I was really taken with her use of language and with her exhibition at IMMA, and so the idea behind the curated series of performances at the IMMA Summer Party came about. In the Silence of the night is a line taken from Etel Adnan’s novel Sitt Marie Rose; the style of writing is a mixture of conversations, news bulletins, monologues, and interviews. The idea was to engage with open forms of expression, through spoken word, live art, sculpture and music. The performances were experimental in design but ultimately were a celebration of live gestures and collaborations. The performances were staged in the garden terrace, the courtyard and the formal gardens a t IMMA, punctuating the evening. The garden terrace was intimate and allowed for the audience to come and go during performances. The night began with Ruth Proctor; tap dancers interpreting the sound of a Columbian rainstorm that was recorded by the artist. Each tap dancer did a solo interpretation until it reached a crescendo with three dancers on stage. The effect was immediate; drawing people from the gardens and the Great Hall by the amplified sound of the dancers. Dimitra Xidous’ rhythmic poetry set the stage for the first of the spoken word performances. Her style is performative in delivery and both personal and humorous: the audience responded with loud laughter and applause after every poem. Next we had Sarah Jones, who wrote a play in response to IMMA Collection Fragments – Jones and a collaborator acting a play referenced the setting and the historical nature of the IMMA/Royal Hospital Kilmainham building, as well as Deborah Brown’s Glass Fibre Form Orange in particular as it currently hangs with the Bird of Paradise flower, and Gordon Lambert’s collection. The descriptive nature of the piece allowed the audience to imagine themselves within the east wing looking at the piece. The audience was engrossed in listening so as not to miss a piece of the story. Ella De Burca stormed the stage with ‘Aphorisms: I Knew That Word Once’. 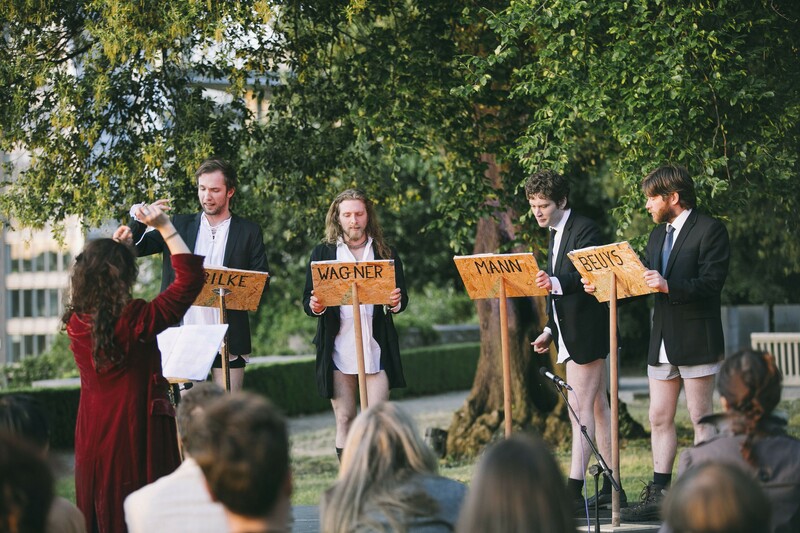 It involved four actors who played historical individuals from the past – Rilke, Wagner, Mann and Beuys. The actors debated about concepts of art and creative freedom. De Burca conducted the debates until they collapsed into chaos as the voices competed to be heard. It was an energetic, humorous performance and the audience responded with the same enthusiasm as it was delivered. Sally Rooney followed with a reading from her new poems, which talked about love and relationships and the trials and tribulations of traveling with a lover. While quite personal poems they were quite self-deprecating at times. She had a loyal following of listeners as the evening grew colder. Claire-Louise Bennett read from her new collection of works titled Pond, delivering her musings on everyday existence and visiting Emile Zola’s grave while eating an apple. Her digressions in her stories and sharp wit seemed to charm the audience to go along for the ride. Meanwhile in the courtyard, Ella De Burca’s inflatable Doric column Utilitarian Object #1 begins its rise, the wind swaying the piece as the air filled the column, onlookers taking photographs or queuing for Indian while the artwork ascended. The plaster stucco piece Utilitarian Object #2 was illuminated by the courtyard lights and was more subdued than its neighboring column. Darkness enveloped the formal gardens and set the tone for multi-instrumentalist Dorit Chrylser. Her instrument of choice, the theremin, has a haunting effect, amplified by Dorit’s voice and gestures as she moved around the instrument. Her wizardly playing of the theremin’s invisible energy fields and her dynamic performance kept the audience in thrall as the blue sky turned black. As Dorit’s music faded, Lee Welch’s piece could be seen in the distance as a blue figure illuminated in the garden. The audience gathered by the side of the terrace to watch as the statue, infused by light and fog and seeming to almost levitate from its spot, came alive: an active participant in the evening draped in golden fabric. The audience activated these visceral encounters, which proved to be both provocative and entertaining. As the performances ended we moved towards the Great Hall to get some warmth and to dance the night away.